An unprocessed image of Saturn's moon Titan, captured by NASA's Cassini spacecraft during its final close flyby of the moon on April 22, 2017. There's no turning back now for the Cassini probe at Saturn. 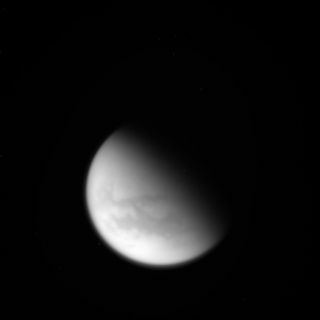 In the early morning hours of April 22, the Cassini spacecraft at Saturn made one last close flyby of Titan, capturing a few final images of this hazy moon. The flyby altered the spacecraft's orbit in such a way that Cassini will be unable to avoid crashing into Saturn this September. Cassini has been studying Saturn and its moons since 2004, and is running low on fuel. For its final act, Cassini is scheduled to make 22 dives between Saturn and its rings, starting April 26. The spacecraft will then dive into Saturn on Sept. 15, transmitting for as long as possible to provide information about the gas giant's atmosphere. An unprocessed image of Saturn's moon Titan, captured by NASA's Cassini spacecraft during its final close flyby of the moon on April 22, 2017, hints at features on the moon's surface. The first ring dive will happen April 26 at 5 a.m. EDT (2 a.m. PDT/ 0900 GMT), but scientists won't hear from the spacecraft for almost an entire day while it's making the science observations. The images and data are expected to come back to NASA and its partners starting around 3:05 a.m. EDT (12:05 a.m. PDT/ 0705 GMT) April 27. The Grand Finale will eliminate the small possibility of Cassini crashing into a region that scientists think could potentially be habitable, such as the moon of Enceladus, and introducing microbes from Earth. If the spacecraft is carrying microbes (which are nearly impossible to eradicate before a spacecraft's flight), those microbes could invade a habitable environment and kill off any native life-forms, similar to what invasive species have done on Earth. To avoid that possibility, the spacecraft will be deliberately steered into Saturn (which is not considered habitable), where it will be destroyed by the planet's atmosphere. Cassini zoomed by Titan at a minimum altitude of 608 miles (979 kilometers) above the surface, probing the area below with radar. Data was returned after the flyby concerning several of the moon's seas and lakes, which consist of liquid methane and other hydrocarbons like ethane. Some of the areas had been imaged by Cassini before, but not using radar, according to a statement from NASA. A close-up of an unprocessed image of Saturn's moon Titan, captured by NASA's Cassini spacecraft during its final close flyby of the moon on April 22, 2017. "Cassini's up-close exploration of Titan is now behind us, but the rich volume of data the spacecraft has collected will fuel scientific study for decades to come," said Linda Spilker, the mission's project scientist at NASA's Jet Propulsion Laboratory in California, in a statement. The craft also captured new radar images of one of Titan's "magic islands," features that have appeared and disappeared in satellite images of Titan's lakes and oceans. Cassini previously observed this "island" in one of Titan's liquid methane seas called Ligeia Mare, where it seemed to change in brightness periodically. Researchers have suggested that the brightness changes are due to waves, solids or bubbles reflecting sunlight, with waves believed to be the most likely explanation.